Kids, eh? 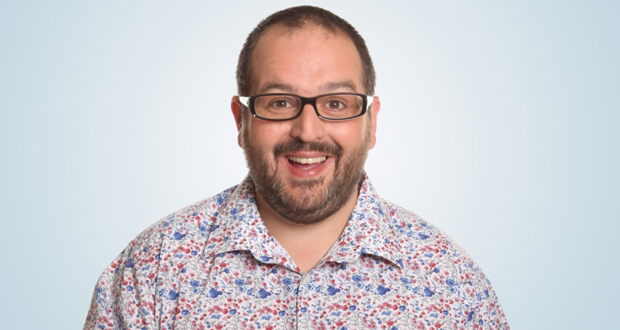 Northern comedian Justin Moorhouse has got two of ’em, and he’s not shy when it comes to telling the truth about what it means to be a parent. His warm, engaging and frequently hilarious routine covers all the bases when it comes to family life, from ruinously expensive day trips to the various trials and tribulations that come with parenting a teenager. He doesn’t pull any punches about the latter, but his love of laughing at his own jokes – combined with his constantly replenished reservoir of good humour and charm – means it’s clear that he secretly loves his humdrum domestic routine…even if he does have to resort to walking the dog to escape it. A lot of the laughs are down to Moorhouse’s use of well timed repetition that helps his jokes gather momentum. He repeats certain phrases, calling to mind fellow North Western comedian Peter ‘Garlic Bread?’ Kay, but also more polished alternative comedians such as Stewart Lee. Speaking of Kay, like several other Manchester based comedians, Moorhouse did appear on the Bolton comic’s working men’s club sitcom Phoenix Nights. It’s a good fit, as there’s has a traditional, old school comedy club feel to his act: a bit of an updated ‘end of the pier’ vibe that we could do with more of at the Fringe. Moorhouse used to be a salesman, and it shows. He’s so good at getting the audience on side and hooked on his every word that he should really teach a comedy masterclass on building rapport. He comes across as a typical grumpy dad, but one who revels in the things that irk him, inserting a note of shocked, amused disbelief to his accounts of everyday irritations that the audience really can’t help but relate to. Is his routine perfect? No. Not completely. Some jokes on the subject of race and diversity don’t quite hit the spot, but on the whole he delivers a solid and extremely witty hour of genuinely enjoyable comedy. What”s more, it’s worth going to see him soon as he’s just got a part on Coronation Street, and we all know what hard task masters ITV are. He might not get next August off, so catch him while you can. He may not be the glitziest or most gimmicky comedian at this year’s Fringe, but he’s definitely one of the funniest. His jokes about fairly mundane, domestic things (teenagers, marital issues, trips to an owl sanctuary) build to a crescendo that – more often than not- have the audience rolling in the aisles. He’s ludicrously funny, and he knows it.